We like these connectors so much we use them on all our products. The connector are ‘insulation displacement’ type – simply poke the wires into the wire grip, and squeeze closed in a vice or with parallel jaw pliers. No need to strip the insulation – this is displaced as the teeth of the connector bite through to contact the conductor. We have used these for many years: they are very reliable and require no special tooling. Unless someone has simply used the wrong wire size, no problems. A detailed diagram of the 6 way IDC connector is shown below. Shows the front of the connector as it is supplied. Notice the wire grip section at the top which has a row of connected holes into which either individual 7/.02 wires may be put or a fixed-pitch (0.1 inch) ribbon cable may be used – the interconnections allow the webbing between the wires in this ribbon to enter the connector. Note the two interference bumps A on the body that are intended to make it difficult to insert the connector back to front. These should locate in the opening of the 6 way male connector. If inserted wrongly they will interfere with the plastic body at the back of the male part. Note also the 1 moulded into the connector body. This is absent on some connectors. It should be ignored. Shows the front of the connector but the ears on the wire grip have been gently opened to allow the wire grip to be separated. You never need to do this but the grip may become separated accidentally. Note the ratchet style teeth on the side of the body that mate with the cable clamp. Shows the connector closed. The wires have been omitted for clarity but you should insert the wires fully into the wire grip before closing the connector. If you accidentally close the connector the sides of the wire grip can be gently prised outwards to release them from the ratchet style lugs on the side of the body while the wire grip is lifted off the body. Take case not to bend them to far or they will break. A couple of dressmaker’s pins inserted upwards could make the job easier. Shows the back of the connector. Note the two locating teeth on the top of the wire grip that mate with the latch on the body of the male section. These teeth are on the back of the wire grip whereas the interference bumps on the body are on the front. 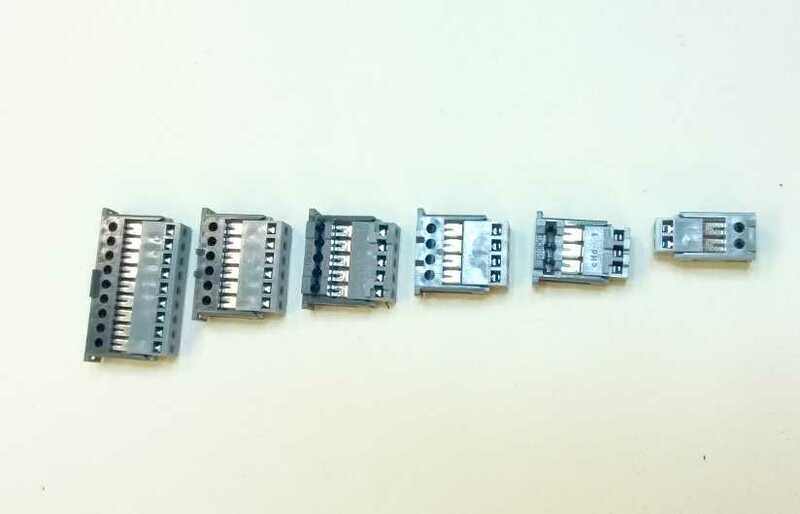 When re-opening a closed connector, some of the contacts may be retained in the wire grip – if so you may need to pull them out and re-insert them into the body.